I love anything and everything sweet potato related. In addition to being such a bright, beautiful veggie, it’s chocked full of amazing nutrition. They’re an excellent source of vitamin A (in the form of beta-carotene), vitamin C, manganese, copper, pantothenic acid, and vitamin B6. But wait! There’s more! They also provide potassium, dietary fiber, niacin, vitamin B1, vitamin B2, and phosphorus. Oh, and did I mention they taste so damn good? And they’re a mega versatile food? For real. Get off my plate and into my belly! My amazing husband hails from Texas, so he loves Tex-Mex seasoning. The spicier, the better for him. 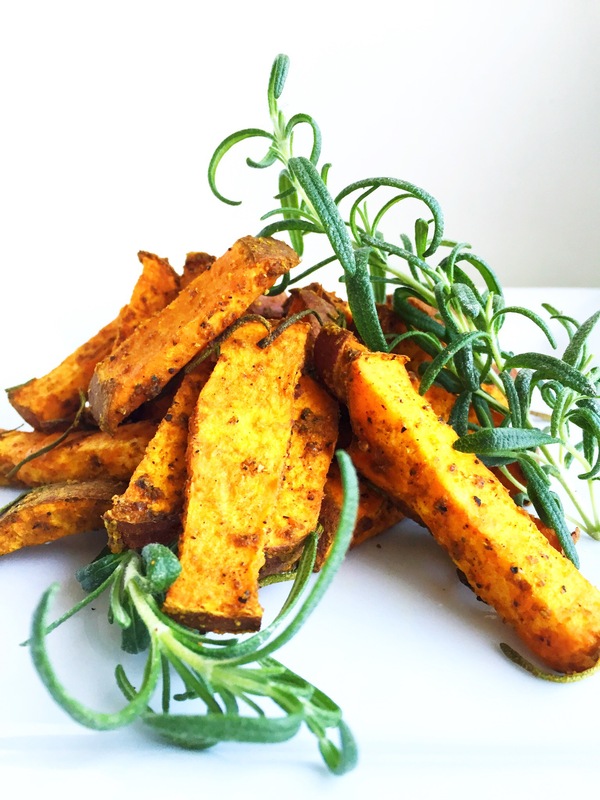 For these fries, I used a fairly savory mix and cut fresh rosemary leaves from my herb garden. If possible, opt for fresh, because the aroma and additional flavors are totally worth it. I grow my own herbs for such a cause as this. 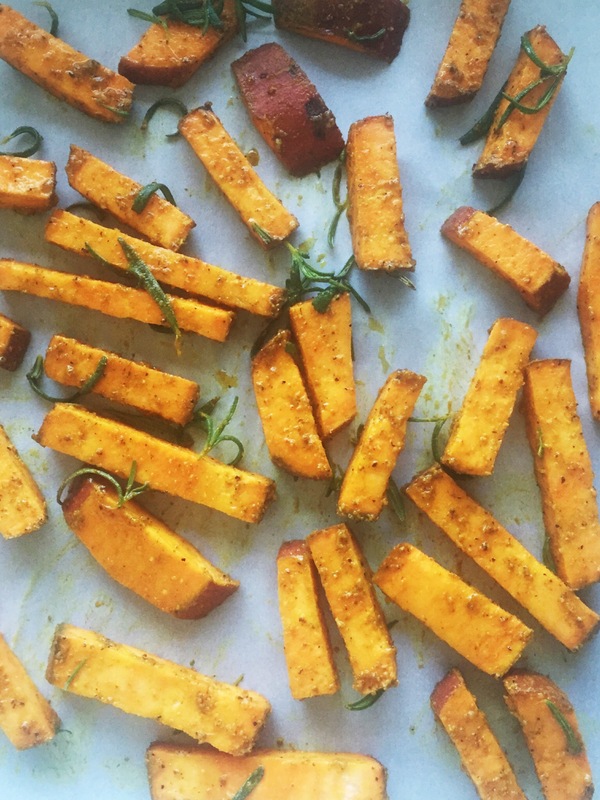 Side note: when it comes to sweet potatoes, it’s worth getting organic. The skins are full of amazing nutrients, and since they grow and stay in the earth, you want a mineral rich soil; organically grown plants always have much more healthy soil as well as care of the plants. Thoroughly wash sweet potatoes. Leave skin on for more nutrients, or peel according to personal taste. Slice into fry-like shapes, maintaining approximate size to ensure all fries cook evenly. 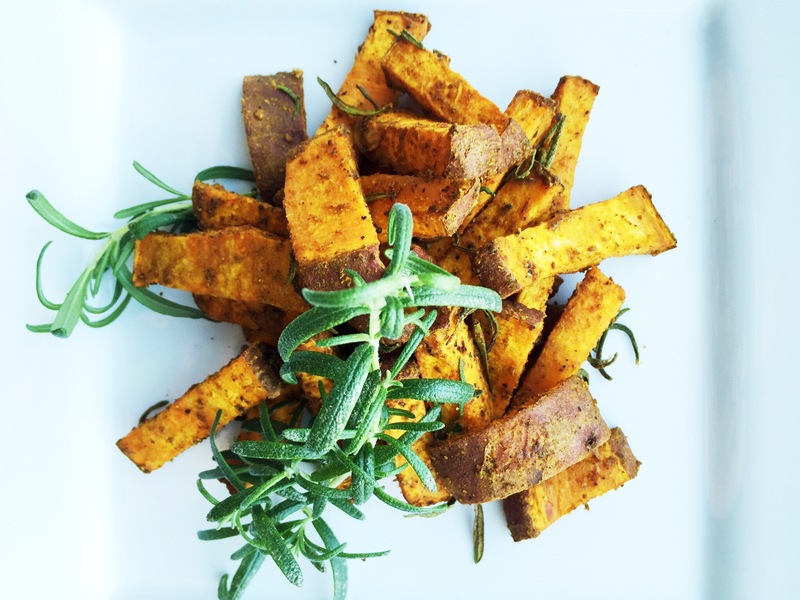 In large mixing bowl, toss sweet potato slices in, spray lightly with coconut oil or drizzle straight coconut oil on them. Generously season with salt and seasoning. Add in rosemary, stripping the leaves from the stalk. Toss in bowl and make sure all pieces are evenly coated with seasoning. Lay sweet potatoes on greased pan, and put in oven on 425-450. Roast for 10 minutes, take out and lightly shake pan to redistribute the pieces, then return to oven for additional 5 minutes. Let fries settle on the pan for a few moments after taking out of the oven.